Imagine being in college and being deaf-blind. What opportunities might you have? What types of challenges would you face? This publication describes a study that begins to answer these questions. During the study, 11 college students with deaf-blindness were interviewed about their college experiences. They were like most college students in many ways, but in addition to managing their classes and social lives, they had to educate others about deaf-blindness, adjust to changes in their vision, coordinate interpreting services, and get orientation and mobility instruction. These students are truly role models. As more young adults with deaf-blindness begin to attend college, it is essential to understand what college is like for them and make sure they have the support and assistance they need to be fully included in college life. At the time of the interviews, most of the students were between ages 18 and 22 and all attended a small 2-year college for students who are deaf that is housed on the campus of a larger college. The majority have Usher Syndrome (a condition that typically causes hearing loss early in life and vision loss beginning in adolescence or young adulthood) and use sign language or a combination of signs and speech to communicate. Students struggled at times with their social relationships. They had little free time, did not always feel welcome in the college's strong deaf community, and had difficulty starting conversations with others. They managed their emerging identities as individuals with deaf-blindness in different ways. Some hid their visual impairment, while others were very open and felt it was important to educate people about deaf-blindness. All required and received extensive support from the college and their states' vocational rehabilitation offices and commissions for the blind. Some felt very well supported. Others were more critical of the difficulties they faced coordinating services and getting support. People always seem to underestimate what we can and cannot do in a college classroom. . . . They thought that I would not be able to keep up. But is it your right to say that I can’t do that without giving me a chance? I’ve informed all my teachers that I have Usher Syndrome, so I might have a hard time reading normal print. Teachers will say, “Oh! fine,” and they have things ready for me. . . . Some teachers are really motivated and willing to help me out to improve my education. I go to class all day, struggle with class, and then I go straight to my dorm room and do my homework. Because [of] the things I’ve missed [in class], I gotta do it again in my dorm. And that’s one of the reasons why I’m so isolated. It's challenging to find friends here. My success rate finding friends is 10 percent - at best. The students in this study had a great deal to say about their social lives. Some had a wide network of friends, while others struggled to connect with peers and talked about how hard it was to meet people during classroom and campus activities. Those who had difficulties described a number of barriers to social relationships. Some students reported they had no time for leisure activities because of the extensive time it took just to keep up with their coursework. Because vision impairments make it difficult to see people at a distance and pick up on social cues, many students had a hard time initiating conversations with others. As Hurcane said, “For each person who has a visual disability, they do not always go out seeking people, they have to wait for people to come to them. Cause they can’t see the people.” Joey, who has peripheral vision loss, explained that people sometimes wave for his attention from the side and don’t realize that he can’t see them. “Some people thought I was arrogant and ignoring them,” he said. Watching and participating in sporting events is also challenging. For example, tunnel vision associated with Usher Syndrome makes it hard to follow fast-paced games like basketball and football. It wasn’t possible to change my situation, so I had to accept that I have Usher Syndrome...I needed to just move on with my life. You have to just put an end to feeling bad about it. Some of the students knew about their visual impairment at a young age, while others were just beginning to learn about Usher Syndrome and their changing vision. All grew up deaf or hard of hearing, and most were in the process of adjusting to diminished vision. They were undergoing changes in how they thought of themselves as deaf and deaf-blind persons, and this affected their social relationships. Some embraced a deaf-blind identity, while others did not. Some hid their visual impairment, while others were open, telling others freely why they might not say hello in passing (because of tunnel vision), or why they used a cane only at night (because of night blindness). Students who are deaf-blind need very good resources— human and technological—to help them succeed. The experiences of the students in this study varied greatly. Some felt they received excellent support, while others had difficulty getting what they needed. Students who are deaf-blind are often more limited by the attitudes of others and limitations others impose on them than they are by their hearing loss and visual impairment. They need opportunities to participate in challenging and enriching classes, and they have the right to try new things, to fail, and to try again, just like any other college student. Some students in the study felt they were not given a chance to show what they could do. Students who are deaf-blind need a range of individualized accommodations to help them access lectures and course materials. These vary depending on the type and degree of each student’s vision and hearing loss and may include the use of interpreters familiar with deaf-blindness, assistive-listening devices, large print or braille materials, and specialized computer software. Several students in the study described difficulties doing well in their classes because they either did not have accommodations or the accommodations provided did not work. For one, passing a particular class took two attempts, not because he could not do the work, but because the technology provided for him did not work the first time he enrolled in the class. Many students described the pressure they felt having to continually explain deaf-blindness to others and to figure out and obtain what they needed. For example, Ricky said that some teachers had no idea what to do, or how to do it. He said, “It was hard; I had to teach them. . . . I felt like I was always explaining all the different variables.” In addition, expressing what they need may be difficult for many young adults who are deaf-blind. It is important that college personnel take some of this burden on themselves, reach out to these students, and work with them to meet their needs. Treat the students as experts when choosing accommodations. They know the most about what works for them. Be flexible regarding the time it takes to get a degree. Students may need reduced course loads or time off between terms. Persevere when things are not working. It may take time to find the right combination of supports. Provide awareness training for staff and faculty, especially for those who work in disability and interpreting services. Make sure at least two campus staff members are knowledgeable about each student’s needs and are available to serve as contacts to ensure that students have continuous access to support. Connect with your state's commission for the blind, commission for the deaf, and Helen Keller National Center regional office. By working with these agencies, you may be able to help students get assistance from local services (e.g., eye doctors, O&M instruction, or financial aid). Hire interpreters and support service providers (SSPs) to help students access social events. Review local transportation options with students so they know what is available. Students who are deafblind rely on public transportation. Alert groundskeeping staff that there is a student with deaf-blindness on campus. It is important to keep walkways and curb cuts clear, especially in snowy regions. Interviews with students who participated in the study were conducted in sign language, videotaped, translated into English text, and analyzed for common themes. Although this study included just a small group of students, their experiences may help college personnel and adult service providers to better understand what the students need to be socially and academically successful. The names of the students in this publication are not their real names, and the photographs are of students who were not involved in the study. Arndt, K. (2010). 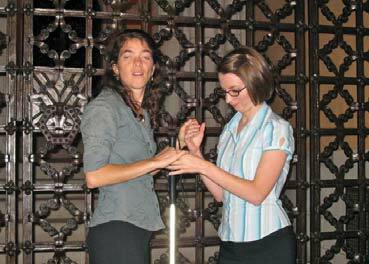 College students who are deafblind: Perceptions of adjustment and academic supports. AER Journal: Research and Practice in Visual Impairment and Blindness, 3(1), 12-19. Arndt, K. L. (2005). “They should know they have Usher Syndrome around here”: College students who are deafblind. Doctoral dissertation, Syracuse University. Available from www.proquest.com. For more information about deaf-blindness contact DB-LINK Info Services at NCDB (see the contact information below). NCDB: nationaldb.org (Click on “Selected Topics” and choose "Postsecondary Education"). About the author: Dr. Katrina Arndt is an Assistant Professor of Inclusive Education in the Ralph C. Wilson School of Education at St. John Fisher College. She has an extensive teaching background in special education in urban and suburban classrooms and is committed to educational reform that supports inclusive practices for all students. Dr. Arndt’s research interests include qualitative studies with people who have visual impairments and deaf-blindness. Electronic copies of this and previous issues of Practice Perspectives (including large-print and Spanish versions) are available at https://nationaldb.org/library/list/102. Design and layout by Betsy Martin-Richardson (NCDB). The purpose of NCDB Practice Perspectives is to expand and broaden the use of current information resources by developing easily understandable products with accessible formats.